Doctor Will Caster (Johnny Depp) is the foremost researcher in the field of Artificial Intelligence, working to create a sentient machine that combines the collective intelligence of everything ever known with the full range of human emotions. His highly controversial experiments have made him famous, but they have also made him the prime target of anti-technology extremists who will do whatever it takes to stop him. Their worst fears are realised as Will’s thirst for knowledge evolves into a seemingly omnipresent quest for power, to what end is unknown. The only thing that is becoming terrifyingly clear is there may be no way to stop him. The 'Transcendence' competition has now closed. Winners will be announced shortly. Competition opens at 5pm AEST on Sunday 24th August 2014 and closes at 11:59pm AEST on Sunday 31st August 2014. Five winners will be chosen at random on Monday 1st September 2014. To successfully win, entrants must fulfil the above entry conditions before the time the competition closes. Current members/followers are eligible to enter the competition. Only one entry per person. Only one winner per household. To be a valid winner, the entrant must not have won a prize from SWITCH within the last 28 days. 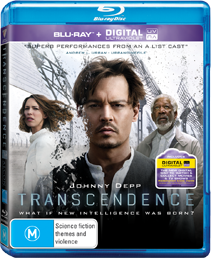 Each winner will receive one Ultraviolet Blu-ray copy of 'Transcendence'. By entering, you agree to receive occasional emails from SWITCH in the future. If you decide to unsubscribe from these updates, any further entries will not be applicable. Only Australian residents are eligible to enter. 'Transcendence' is available on Digital, Ultraviolet Blu-ray and Ultraviolet DVD on Wednesday the 27th August 2014 from Roadshow Entertainment.